Entropy never looked this good. Or, certainly, it looks a lot better than when I broke that beer glass. (I know, I know: there are reasons why we don’t want to live in a universe where doing that would make the glass re-assemble itself from its fragmented shards.) Photo courtesy the designers. In an elegant, balletic dive, taking an almost impossibly-long span of time, a single droplet of water falls and splashes, an animated logo peeking out from the inside. But it’s what isn’t there that may surprise you. There’s slow motion camera behind the scenes, meaning the usual way of doing this is absent. 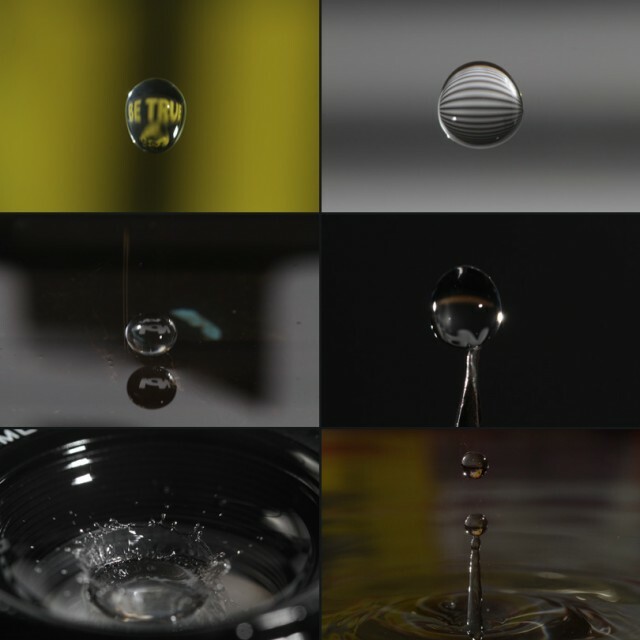 Instead, what you’re seeing is a stop motion time lapse – a record of the shifting patterns of entropy in nature, thousands of different droplets appearing as connected that in reality are not. It’s a trick of animation and high-speed lighting, not high-speed photography, stroboscopic illusion. And it’s a fun DIY project, to boot. 3D and robotics? Okay, we’re in. We got your contact through Alex Trochut, who shares studio here in Barcelona with us. We are big admirers of Create Digital Motion, so we would love to share with you our new piece Entropy, a joint effort from our 3D division and robotics Lab, in which we created a system to capture the fall of a water drop without a slow-mo camera- with replacement animation mapped inside the drop! There’s an Arduino involved, as well as our self-developed Motion Control. Entropy – IdN Magazine v20n2 from Physalia Studio on Vimeo. Making of Entropy – IdN Magazine v20n2. from Physalia Studio on Vimeo. 1. A laser beam-photodiode, to detect the water. 3. A DSLR, the camera the trigger circuit will trigger. 4. A custom-built water course made by hacking a medical drip. 5. A motion control rig that tilts the camera’s lens with the water. 6. (My favorite part) a servo whose sole job is to tap keys on the keyboard for serial communication via Arduino. And it’s inspired by Homer from The Simpsons – the best kind of hack. 7. A whole mess of Arduino code. 8. Some conventional digital animation, then mapped to the photos. Fantastic. Hope we see more from this crew.